- Fashion Ecstasy on 九月 18, 2018. 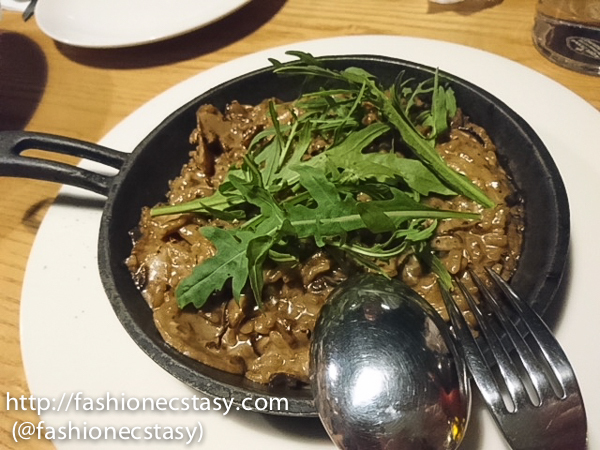 Fashion Ecstasy hosts its monthly exclusive tasting at Trattoria di Primo Taipei Dazhi location. Trattoria di Primo is an upscale Italian Restaurant that uses top-notch 3-star Michelin grade ingredients in their creative cooking. The satisfaction we were left with from our first private tasting last time was the reason for choosing it as our event venue once again. Trattoria’s Executive Chef Roy curated an exclusive customized seasonal menu just for Fashion Ecstasy’s VIP guests. Thanks to our punctual VIPs, dinner was served on-time with minimal waiting. As soon as all our VIP guests arrived, our private chef treated us to a dinner show with no procrastination. With a double handle wide cheese blade, he reveals his hidden biceps and puts them into work. Next up is appetizer di trio, which includes a Polenta di pecorara, Bistecca al Forno e Crema Anchovy and Prosciutto di Capasente. Polenta di pecorara is slow-cooked lamb shank served on polenta, the lamb is cooked to medium rare and retains its juiciness. The polenta adds vibrant colours to our first Instagram worthy picture! Bistecca al Forno is a piece of juicy veal served with Anchovy sauce made with anchovies, Mascarpone garlic and cream. Adding Mascarpone results in a more refined taste in the sauce and removes the fishy taste of the anchovy. Pan- fried scallops are big in size, and wrapped with prosciutto. The two make a great combination in taste. Zuppa funghi is mushroom cream soup. The soup is made thick with a generous amount of sliced mushroom (almost as much as the soup on its own! ), then topped with a spoon of fresh cream foam. This creation is a complimentary dish for Fashion Ecstasy’s VIP guests only, courtesy of Chef Roy. Mussels are cooked simply with white wine and retain every bit of their seafood flavour, making you hit the protein/seafood spot! If my post-stroke brains counted correctly, 11 guests had (at least) 11 cameras/cellphones out to take pictures of this dish. The gentleman beside me took 22 pictures in 30 seconds (watch video XD). Orecchiette is a kind of round pasta with its shape resembling “little ears. The pasta is chewy itself, the natural sweetness of pumpkin balances out the saltiness in the prosciutto, the pumpkin also adds a vibrant, gold colour to the dish, making it another Instagrammable picture. A real Italian will tell you the secret to ordering the best Italian pizza is to go for the Pizza Margherita with minimal ingredients.Besides topping the crust with whole mozzarella balls, our chef adds an incredibly generous amount of freshly shaved parmesan cheese when served. Seafood Pizza is a beautiful symphony of mixed seafood including shrimp, clams, and herring fish. Seeing the colourful toppings make our hearts dance. This dish literally translates as “saliva seafood.” Not because our server spat in our food (hopefully I offend them); but because it does make you drool!The seafood mix include French Mussels and whole shrimpsChef Roy uses the same cooking method as the French Mussels to bring out the most of its seafood taste. Now its either hitting the gym or looking for wifey after this protein packed meal. known as the Italian roast- pork, this dish is one of Abruzzo’s famous cuisine. The pork is slow-roasted and served with a thickened balsamic sauce. After a large meal filled with excellent ingredients, the easy to swallow creme brulee puts a perfect end to Fashion Ecstasy’s exclusive VIP tasting at Trattoria di Primo’s Taipei Dazhi location.